Benjamin Moser is a writer, editor, critic, and translator who was born in Houston in 1976 and lives in the Netherlands. After attending high school in Texas and France, he graduated from Brown University with a degree in History. He earned his M.A. and Ph.D. from the University of Utrecht. He worked at Foreign Affairs magazine and Alfred A. Knopf in New York before becoming an editor at the Harvill Press in London. He was the New Books columnist for Harper's Magazine before becoming a Contributing Editor on visual art and a regular contributor to The New York Review of Books. His work has appeared in many publications in the United States and abroad, including CondÃ© Nast Traveler, Newsweek, and The American Scholar. 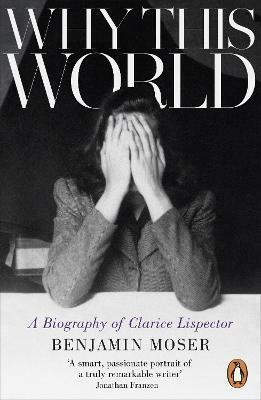 His first book, Why This World: A Biography of Clarice Lispector, was published by Oxford University Press (USA), Haus Publishing (UK), Cosac Naify (Brazil), and CivilizaÃ§Ã£o (Portugal). Editions are forthcoming in France and Germany. He is the Series Editor of the new retranslations of Clarice Lispector to be published in the United States by New Directions and in the United Kingdom by Penguin Modern Classics. A new and passionate biography of one of Brazil's most important writers. 'That rare person who looked like Marlene Dietrich and wrote like Virginia Woolf', Clarice Lispector is one of the most popular but least understood of Latin American writers. Now, after years of research on three continents, drawing on previously unknown manuscripts and dozens of interviews, Benjamin Moser demonstrates how Lispector's development as a writer was directly connected to the story of her turbulent life. Born in the nightmarish landscape of post-World War I Ukraine, Clarice became, virtually from adolescence, a person whose beauty, genius, and eccentricity intrigued Brazil. Why This World tells how this precocious girl, through long exile abroad and difficult personal struggles, matured into a great writer, and asserts, for the first time, the deep roots in the Jewish mystical tradition that make her the true heir to Kafka. From Chechelnik to Recife, from Naples and Bern to Washington and Rio de Janeiro, Why This World strips away the mythology surrounding this extraordinary figure and shows how Clarice Lispector transformed one woman's struggles into a universally resonant art.